Let me introduce to you one of the best things about Florence, Italy: the secret bakery (panetteria segreta). There are a few scattered around town, and you've probably walked by them a dozen times without even realizing it. There is no sign on the door, no open store hours. The only way to find them is through directions from word of mouth and by following your nose...at 1:30 in the morning. The secret bakeries in Florence are where all the pastries you see in cafes during the daytime are made after they're distributed. Once you find the secret bakery, politely knock on the door and wait for a baker to pop his head out. Be quiet while you wait. They will not open the door for you if you're loud and obnoxious. (I've seen Italians throw water balloons out their windows at loud and obnoxious people). 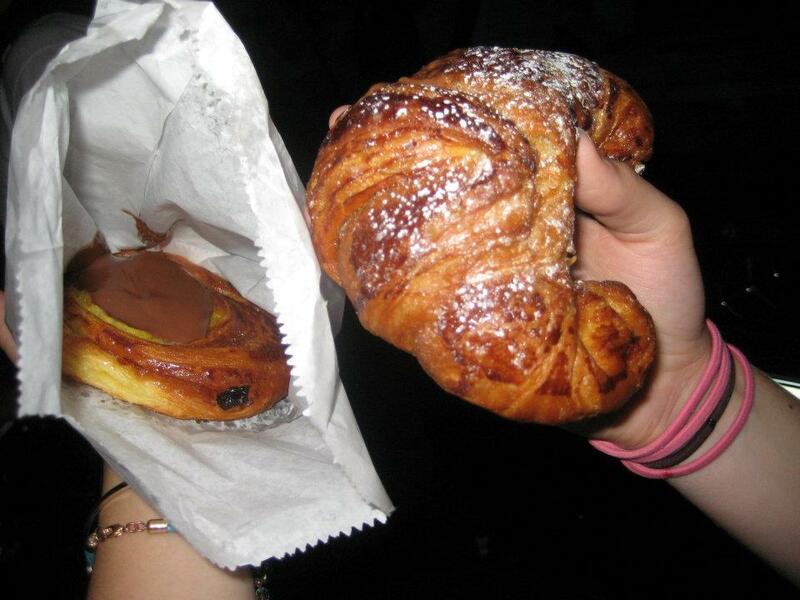 Order however many croissants you want (sometimes they have mini pizzas) and the items will be a euro each. They don't take credit cards, obviously, so make sure to have your euro coins on hand. Enjoy the warm, delicious, chocolate-y or lemon-y or whatever you got as an end-of-the-night treat. Note: at this time of night, it is best to not go alone - there are a lot of dark alleys in Florence and you want to stay as safe as possible. This one is near Piazza Santa Croce, which is also close to many bars and nightclubs. If you see Angie's Pub or are on Via delle Brache, you're not on the exact street, but you're very close. Look for a frosted glass door. This one is to the left of the Santa Croce church, and is close to the gym I used to go to on Via dei Pepi. If you're facing the church, turn left onto Pinzochere and look for a small crowd of people or the scent of baked goods. If you've reached Via Ghibellina, you've gone too far. To be totally honest, I'm not 100% sure this secret bakery is still in business. This was our go-to secret bakery when I studied abroad due to its close proximity to where our pensioni were. Since this bakery has the typical brown door, follow your nose! Have you come across any additional secret bakeries in Florence? Share where they are in the comments!